✔ SMART CONTROL - Control the smart power strip by using "Smart Life" app, enjoy controlling your home/office appliances remotely using your phone, set timer/countdown/different themes to control multiple devices as you wish. ✔ INTELLIGENT FAST CHARGING - A smart power strip with 4 AC outlets plus 3 USB charging ports gives you the ultimate freedom to power 7 electronic devices, and the intelligent fast charging technology also assures you a fast, steady and safe charging current. ✔ ULTIMATE SAFETY - Equipped with surge protector and Push-to-Reset circuit breaker, making your appliances worry-free while charging, it will switch off automatically once overloaded/overvoltaged, and fire-proof ABS coating material ensures there is zero fire hazard in your house. Offer you the convenience of a smart lifestyle while guarantee you with the down-to-earth high quality power strip. 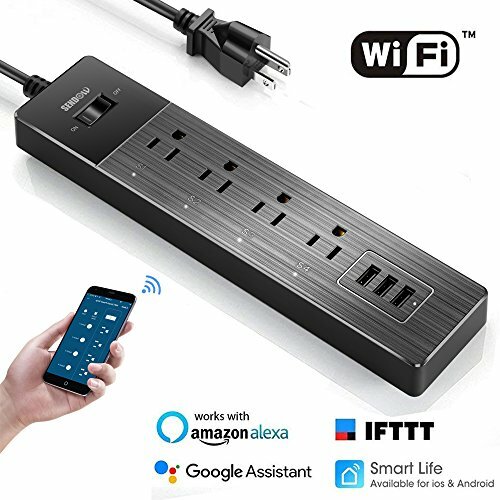 ✔ WORRY-FREE WARRANTY - SENDOW smart power strip passed FCC & ROHS certificates, enjoying a modern & convenient lifestyle with this wifi smart power strip. You will get a 1-YEAR warranty service, professional customer service & any assist during usage via Sendowtek@hotmail.com. If you have any questions about this product by Sendowtek, contact us by completing and submitting the form below. If you are looking for a specif part number, please include it with your message.